High Desert Carpet Cleaning in Hesperia CA. My name is Francisco Aponte, Owner of High Desert Carpet Cleaning. I look forward to being of service to you and your family! Hello, my name is Francisco Aponte, and my wife Kimberly and I are the owners of High Desert “Dry” Carpet Cleaning. We have been long term residents of the area, my wife Kimberly is a graduate from Cal State Fullerton with a major in accounting and has over 15 plus years of business experience. I myself have over 20 plus years of sales and customer service experience and I am 100% fluent in Spanish. We believe in using only green safe chemicals, since we have a son with Asthma since he was 1 year old. We have to make sure our house is always clean, and be very careful about the chemicals used around the house. There are so many families out there with our similar situation, with allergies and chronic diseases, we believe that our dry carpet cleaning method is the best way to keep our house clean from allergens, mildew, etc. We started High Desert Dry Carpet Cleaning to introduce “The New Green Way To Clean Carpet” to our friends, neighbors, home owners and businesses in Hesperia, Victorville, and the surrounding areas. 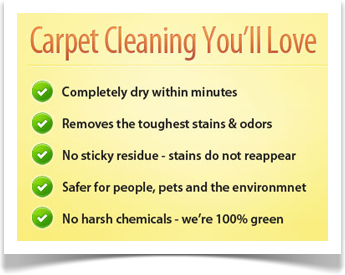 Our special carpet cleaning service is eco-friendly, dry “organic” deep extraction carpet cleaning. What this means is no more wet smelly carpets, no more returning stains, no harsh chemicals and dry carpet cleaning you’ll love every time. In a national survey that polled thousands of consumers about their most bothering issues when it comes to carpet cleaning, the overwhelming #1 complaint was that their carpet was left too wet and took too long to dry. The #2 complaint was that stains came back after the carpet had finally dried. Our idea is simple. Doesn’t it make since to provide a carpet cleaning service that addresses and resolves these issues? We believe it does and that’s the reason we wanted to be the first in the High Desert area to introduce the new, modern way to clean carpets. The carpet cleaning industry has come a long way in 50 years. With modern low moisture carpet cleaning systems (like we use), your carpets will be totally dry in 30 minutes or less; stains will not come back; carpets will repel dirt after cleaning; and your carpet will stay clean much longer. We think you’ll love it. In fact, we guarantee it! Can all of our customers in Victorville, that love our service and the New Way To Clean Carpets possibly be wrong? We don’t think so! And Neither Do They! Call High Desert Carpet Cleaning Today, and experience a much better way to care for your carpets and your health! We’re A Locally Owned Family Business! We’re not trying to be the biggest carpet cleaning company in town – but we are determined to be the best! Locally Owned And Operated Family Business! Proudly Serving The California High Desert Area. We hope you’ll give us a try! We look forward to earning your business and adding your name to our list of happy, happy customers! We provide services within the Greater High Desert area and including Hisperia, Victorville and Barstow.